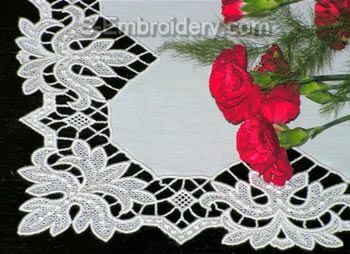 A fine set of 3 freestanding lace machine embroidery designs. 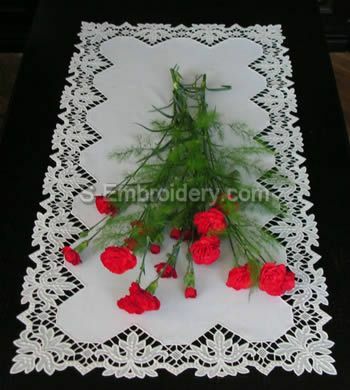 The combination of the 3 lace components and suitable fabric will let you create a beautiful doily, table runner or table cloth with the size you need. The table runner featured on this page measures 17.7 x 37 inches (45 x 94 cm) and was created by stitching out 4 times the Freestanding Lace Border #1; 4 times - the Freestanding Lace Border #2 and 12 times - the Freestanding Lace Border #3.